The Spring Scent Inspired collection was a big hit among Blueberry Pet's customers since 2013, and now we decide to go beyond the regular collar, leash, seat belt and harness! We are expanding our product line by offering another dog safety solution - martingale dog collars to keep your four-legged friends safe. They are the best dog collar for dogs that slip out of regular buckle collars, and will keep your dog safer on leash. It is also a great training collar preferred by most dog trainers. This martingale collar is fully adjustable. 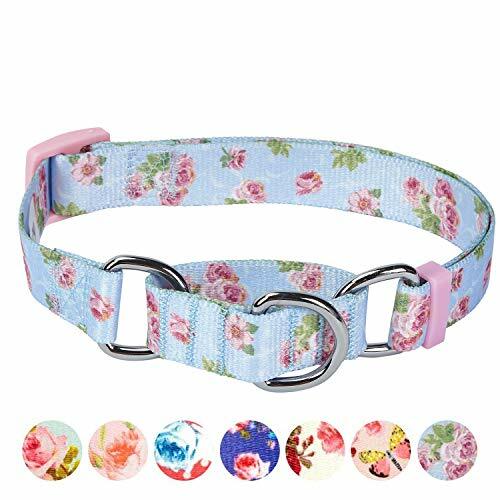 Blueberry Pet's new martingale collar is perfect for everyday wear. Elegant and simple, just like the Spring Scent Inspired collar, this martingale collar comes with combined practicality and reliability: comfy polyester materials and durable hardware.